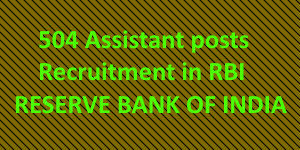 RBI latest recruitment 2015-16 Assistant posts all over in INDIA.Applications are invited from eligible Indian Citizens for the post of Assistant in Reserve Bank of India (RBI).Selection for the post will be through a country-wide competitive Online Examination and Interview. Between 18 and 28 years. Candidates must have been born not earlier than 02/06/1987and not later than 01/06/1997(both days including) are only eligible to apply. Upper age limit will be relaxed for Reservation categories as per the norms of government. Rs. 50/- for SC/ST/PWD/ExS.Rs. 150/- for others The application fee shall be paid in Online mode only i.e. net banking/credit card/ debit card/IMPS/cash cards RBI Assistant online application. Scan their photograph and signature ensuring that both the photograph and signature adhere to the required specifications as given under Guideline for photograph & signature scan and upload(AnnexI). Have a valid personal email ID and mobile no., which should be kept active till the completion of this Recruitment Process. Bank may send call letters for the Examination etc. through the registered e-mail ID. Under no circumstances, a candidate should share with /mention e mail id to any other person. My father used to work in a bank and after completing my class 10 science examinations, I had gone with him few times to observe the work of a bank. I got bored soon. So I was wondering, what is it like to work in a bank? And the RBI must be different from other banks.